Choosing the right hotel is one of the most important decisions you’ll need to make when planning your bachelor party. Not all hotels in Vegas cater to wild bachelor party groups, making some establishments better than others. When comparing Vegas hotels, you’ll want to choose one that offers perks like clubs, shows, pool parties, casinos, large suites, and other forms of entertainment to keep your guests busy during your stay. To ensure that your bachelor party goes off without a hitch, consider one of the following Vegas bachelor party hotels. Cosmopolitan Las Vegas, located at 3708 Las Vegas Boulevard South, combines old school swank with modern luxury. For a sophisticated celebration experience, the Cosmopolitan Resort offers a wide range of entertainment options. First, you’ll definitely want to make time in your schedule to visit Marquee’s dayclub and nightclub. With more than 60,000 square feet of space, along with a rooftop patio overlooking the gleaming lights of The Strip, Marquee is one of Vegas’ premier club options. At Marquee, you’ll find some of the best DJs in the industry playing international house music. The multifaceted nightclub also offers “The Library,” a discreet VIP hideaway, and the “Boom Box,” a mixed-format area. In addition to checking out Marquee, you’ll want to take your bachelor party to the pool. Bamboo pool has a private canyon-like feel featuring a spacious swimming pool, desert landscaping, and luxurious spa atmosphere. You’ll also discover a hot tub, lavish sunbeds and cabanas, food and drink service, and a pool shop onsite. While staying at the Cosmopolitan, you’ll also want to stop and eat at one of several popular restaurants, such as STK Steakhouse, the Rose Rabbit Lie dinner show, or the Chandelier Bar. There’s a reason that beautiful women flock to this hotel and you’re bound to come across a few lovely ladies looking for a good time. Wynn and Encore are connected and offer numerous shows, venues, and restaurants inside their walls. The Spa at Wynn is the perfect place to start your bachelor party. Schedule an appointment for all of your guests to receive a sensual massage where your tight muscles can loosen, getting you ready for a night of partying. There is also a barbershop onsite where you can go for facial grooming and hairline trims. When it’s time to eat, stop over to the James Beard House for a menu presented by Chef Mark LoRusso, or a savory or sweet bite at Parasol Down. Other delicious options include Lakeside and Costa di Mare. Wynn also offers some of the hottest entertainment in Vegas which consistently attract the biggest headliners in the business. 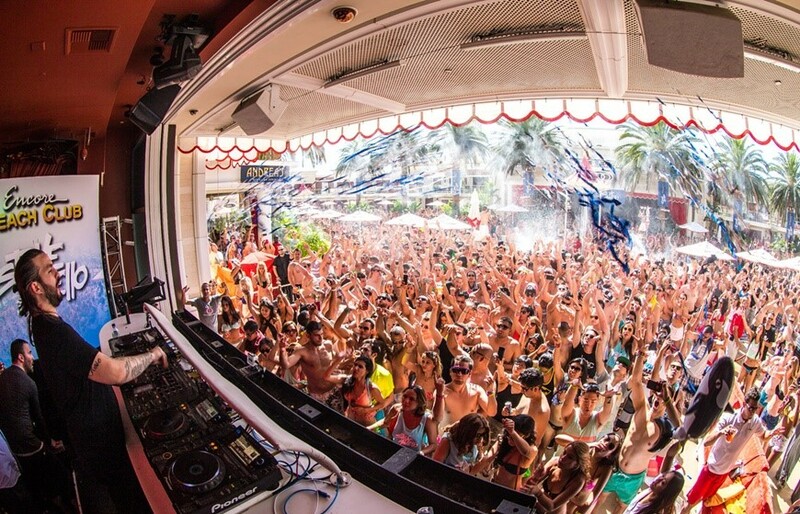 During the day, stop by Encore Beach Club and enjoy the vibrant pool party scene. At night, Intrigue Nightclub and XS Nightclub remain some of the world’s most popular club options. Ask for a VIP table to enjoy some privacy, your own server, and an up close look at the artists and overall party scene. There’s no shortage of things to do and see at Palms Casino Resort at 4321 West Flamingo Road. The iconic resort has remained a fixture in Vegas for many years and they have recently completed stunning renovations that have completely changed the overall look and feel of the hotel. If you have not been to the Palms since the $620 million makeover, consider hosting your upcoming bachelor party there. The Apex Social Club is one of the highlights of Palms. 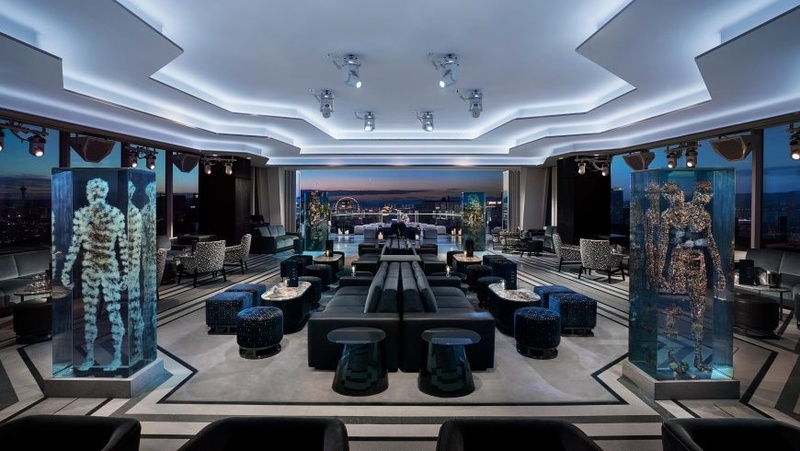 This must-visit spot is located on the 55 th floor of the resort and offers an open air lounge and bar, a premium drink menu, and some of the best views of the city. 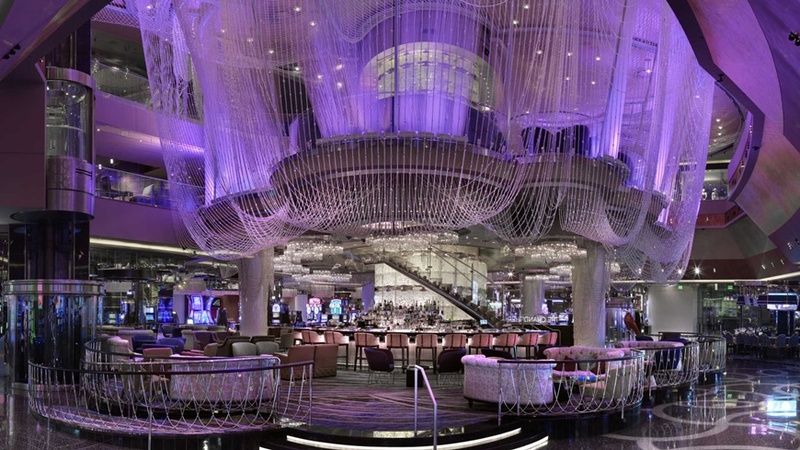 Other great places to visit while staying at Palms include Camden Cocktail Lounge, The Unknown’s Centerpiece, the Pearl, and Scotch 80 Prime. Palms also have large party suites which are perfect for bachelor party groups. Of course, you’ll also want to spend some time at one of Vegas’ newest clubs, Kaos. Kaos Nightclub at the Palms boasts new residencies like Cardi B, G-Easy, Kaskade, and Above & Beyond. The club is massive with more than 100,000 square feet of space, making it the largest nightclub in Las Vegas. Spanning over 85 acres, Caesars Palace is a luxury hotel located directly on the famous Strip. The hotel has 668 rooms including 60 suites and six luxury villas which are perfect for larger bachelor party groups. Since opening its doors in 1966, Caesars Palace has introduced numerous entertainment options for its guests. Its 4,300-seat Colosseum hosts frequent world class entertainers, including Jerry Seinfeld and Matt Goss. You’ll also find countless hotspots throughout the hotel, including Lobby Bar, Cleopatra’s Barge, FIZZ, Omnia, Numb Bar & Frozen Cocktails, Spanish Steps, Seahorse Lounge, and VISTA Cocktail Lounge. If you’re into the nightclub scene, you’ll want to stop by Omnia Nightclub. This interactive nightlife venue by Hakkasan Group is a tri-level venue offering top-notch DJs, dancing, bottle service, and amazing views of the Strip. The high-energy club is more than 75,000 square feet and has four district spaces for guests to enjoy. Caesars Palace also offers other great entertainment options, such as the hotel’s giant swimming pool, high-end restaurants, and of course the Absinthe show. The show combines amazing acrobatics with adult humor and cabaret. It’s a must-see while visiting Vegas. Although the Cromwell Hotel is smaller than our other hotel recommendations, it offers some great perks that make it a great contender for a top bachelor party hotel. First, it has an amazing location directly on the Las Vegas Strip. It’s just a 6 minute walk from The Forum Shops at Caesars Palace and only a 7 minute walk from the Flamingo and Caesars Palace monorail station. The rooms are chic with a Parisian theme and offer large flat screen TVs, elegant bathrooms with rainfall showers, and some even have vintage pinball machines, free-standing tubs, and mini-bars for your enjoyment. Cromwell offers non-stop parties around the clock. It is home to the famous Drai’s Nightclub, as well as Drai’s rooftop dayclub and Drai’s Afterhours. Start your bachelor party at Drai’s Beachclub which spans more than 65,000 square feet and has some of the hottest DJs and live acts. Come night, Drai’s Nightclub offers an indoor and outdoor party space. When the Beachclub closes, head down to the basement level of the Cromwell where the Afterhours club is located. This 13,000 square foot space has two different music formats, two newly added bars, and 55 bottle service tables. It’s the ultimate place to wrap up an epic bachelor party. Don’t settle on accommodations when it comes to your bachelor party. For such a big event, you want to splurge a little to ensure that your celebration is as memorable as possible. The Cosmopolitan, Wynn-Encore, Palms, Caesars Palace, and Cromwell are no doubt some of the most popular and luxurious hotel options in Las Vegas. Any of these incredible hotels and resorts would make for the perfect backdrop to a bachelor party. As rooms go fast, be sure to plan ahead and book your party at one of these Las Vegas hotels.